If you’ve followed me on this blog you know that I like to draw maps. And what started as a hobby later turned into something that I actually make money from. But sometimes you feel like you want to explore new areas of mapping, like making model landscapes. And yes I think you can see that as a kind of map making as well. 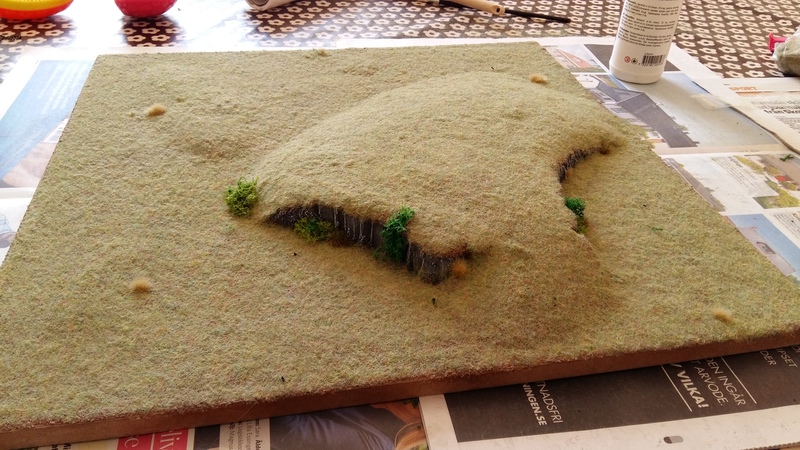 Making model landscapes, primarily for miniature war games, is something that I’ve liked to try out for a long time. I’ve always been fascinated by landscapes that you see at museums or when people play miniature games. Not to talk about those lovely model railways people build. I can stand and watch these small worlds forever. I just love to look at the details that are put in to the models that are at display. So this summer I decide that I wanted to try to make my own table top landscape. Both because I was curious to see if I’d be any good at it and secondly, if it works out well, I might be able to start making these kind of models for commissions. That’s the plan at least. But to find out if this is doable I first had to learn how to do it. And to do that, I turned to YouTube. It’s actually quite amazing to see how many videos on making table top gaming boards and miniature war gaming scenery that are out there. Quite soon I found TheTerrainTutor’s channel which is an absolute gold mine if you want to get into this. Especially I liked the videos he made on basic techniques, those really helped me get up to speed trying to do this myself. After having watched many hours of terrain building videos, I started to make a plan on how to make my own. I decided that I wanted to make the terrain on 45×45 cm MDF boards, that I easily could store away when not in use, instead of going for one big table that needs a large permanent place in the house. With many tiles to use I could also easily make up different variations of my table from the same tiles. All terrain on the tiles, like hills, cliffs etc I would make from Styrofoam. And since I acquired a hot foam cutter I could easily shape the material as I pleased. I would actually recommend everyone that wants to make some miniature terrain to get one, it makes things so much easier. And the end result will look many times better. I also bought some static grass and sand to use as base material for the ground on the tiles. And last but not least you need glue, a lot of glue. In the next post I will take you through the process I used to make the actual hill tile that you can see at the top of this post.